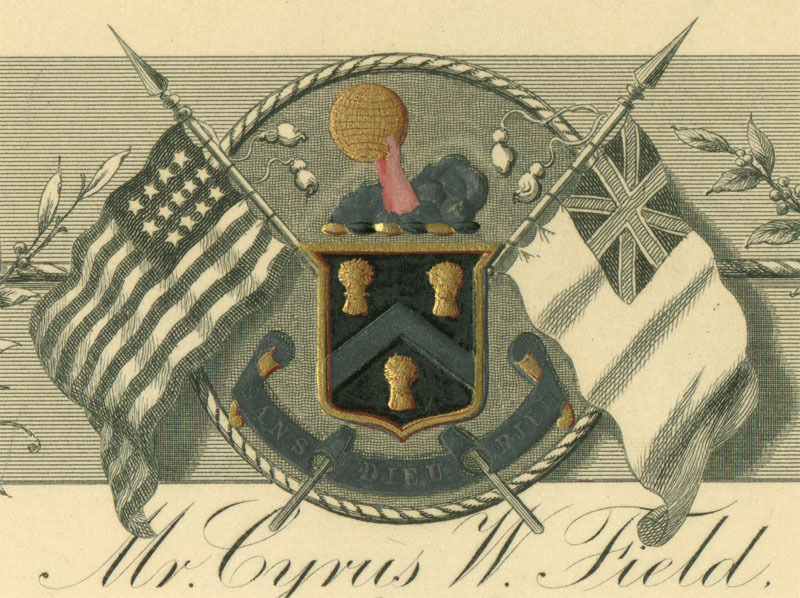 On March 10th, 1854, Cyrus Field signed a contract which would change both his own life and the history of communications. On that date, he and his partners acquired the Newfoundland Electric Telegraph Company, which had the exclusive rights to erect telegraphs in Newfoundland. This was the beginning of his attempts to lay the Atlantic Cable between Ireland and Newfoundland. The project occupied him for the next twelve years, concluding in 1866 with the successful installation of two cables. Since that time, North America and Europe have never been out of immediate communication with each other. 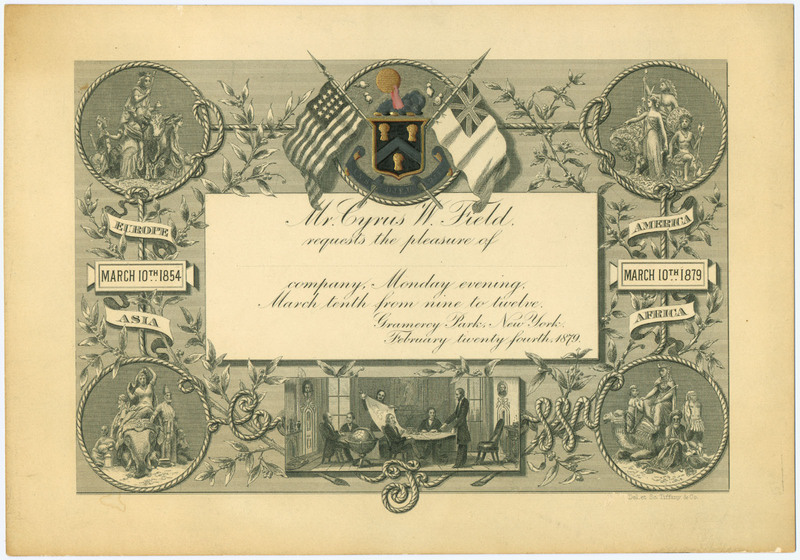 In 1879, Field commemorated the 25th anniversary of this historic contract with a celebration at his Gramercy Park New York residence. 1800 guests were invited and 1000 attended. 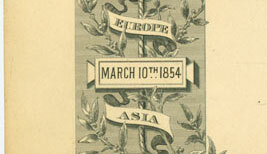 The invitation for the event was engraved and printed by Tiffany & Co., and is reproduced below. Click here for a large (400K) image of the invitation. Cyrus Field's brother, David Dudley Field, made a short speech at the reception, outlining the progress in communications since the organization of the first Atlantic cable company. The following description of the invitation is from Ocean Telegraphy: The Twenty-Fifth Anniversary of the Organization of the First Company Ever Formed to Lay an Ocean Cable. Printed for private circulation only, 64 pages, 1879. 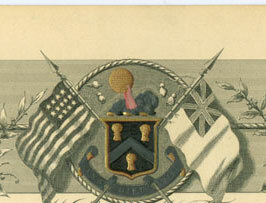 The card of invitation, of which a fac-simile is given, was designed to represent submarine Telegraphy, linking together with its chain of light the four quarters of the globe. In the centre is a white space of the size of an ordinary visiting card, on which is engraved the invitation. Above this is the coat-of-arms of the Field family, which consists of a shield, with a black ground, parted by a chevron of silver, with sheaves of wheat in gold. The crest shows an arm emerging from a cloud, and grasping the world. This is derived from an ancestor of the family, John Field, a distinguished English astronomer, who lived two hundred years ago, and who introduced the Copernican astronomy into England. A more appropriate design could hardly be found for one who has united the Hemispheres. On one side is an American and on the other an English flag, the staffs of which cross behind the shield. 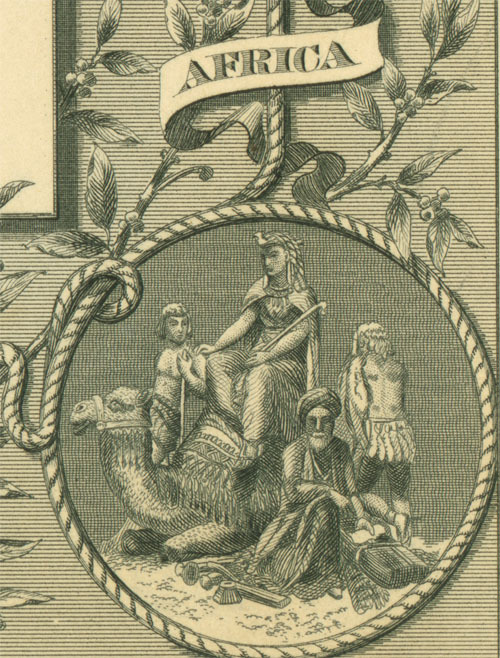 The allegorical figures of the four quarters of the globe will be recognized by all Englishmen as taken from the designs on the Albert Memorial Monument in Hyde Park, London. 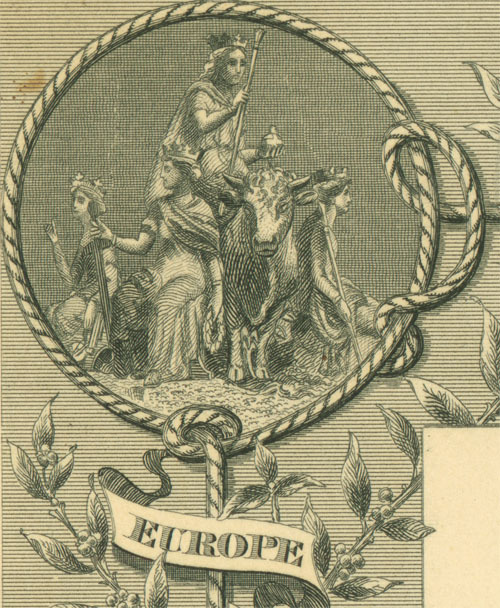 Europe is seated on a bull, the emblem of strength, crowned, holding a sceptre in her right hand and in her left a globe, surmounted by a cross, while at her feet are three symbolic figures, one holding a sceptre, one with an anchor and a wreath, and the third in an attitude of instruction. 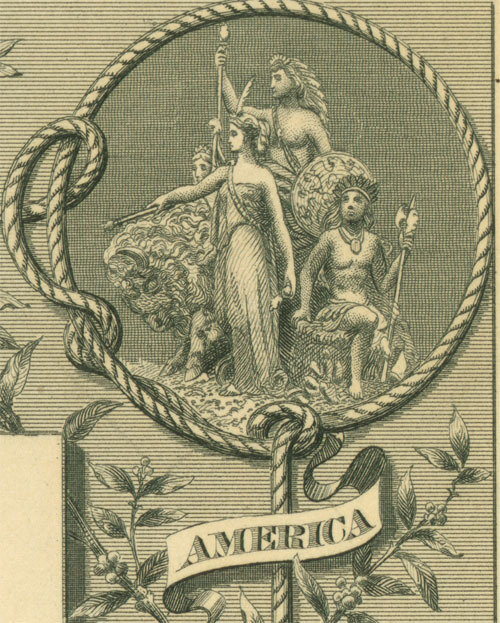 America appears as an Indian, with spear and shield, seated on a bison, with a native warrior behind, while in front a figure of civilization stretches out its wand over the new world. 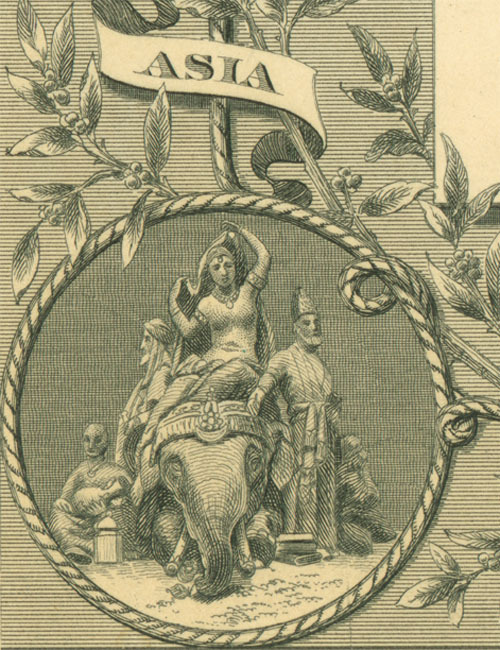 Asia reposes on a kneeling elephant, attended by Brahmin and Buddhist priests; and Africa is perched on the hump of a camel, with Oriental figures around her. 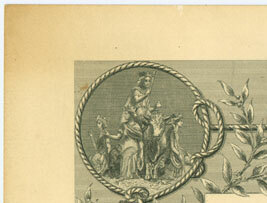 A cable winds around the whole card, making a frame to the medallions. 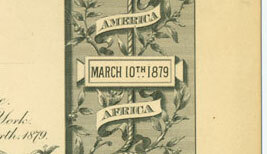 On one side is the date of the origin of the Company, March 10, 1854; and on the other, that of the reception, March 10, 1879. At the foot is the representation of Mr. Field's dining-room, and the six gentlemen who met therein to launch the first cable - Cyrus W. Field, Peter Cooper, Moses Taylor, Marshall O. Roberts, Chandler White, and David Dudley Field. 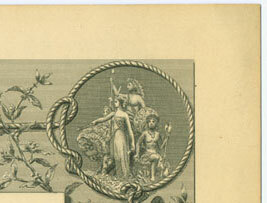 The invitation below has eight clickable areas which will bring up larger images of each section. See the Atlantic Cable Projectors page for more information on the scene in Cyrus Field's dining room.